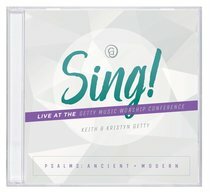 The second annual Getty Music Conference in 2018 focused on the role of the Psalms in worship. This album presents live recordings from the three concerts accompanying this amazing event held in Nashville. Features contributions from Stuart Townend, Laura Story, Phil Keaggy, and more! 11 - Is He Worthy? About "Sing! Psalms: Ancient and Modern"
The renowned Getty/Townend hymn, "In Christ Alone," has remained the most popular song for congregations throughout the UK for six years, among CCLI's top ten in North America, and has been honored by both the British Hymn Society and BBC Songs of Praise all time lists. Their hymns are sung in small churches, large cathedrals and concert halls around the world, performed by choirs of every description, and have also been recorded by artists throughout the world of music, from country artists Alison Krauss and Ricky Skaggs, Irish musicians Moya Brenan and Anuna, CCM artists Natalie Grant, Newsboys and Tim Hughes, to Aida's Heather Headley, and a recent online recording by Owl City. Under the Getty Music label, Keith and Kristyn have recorded two Dove-nominated albums: "In Christ Alone" (2007) and "Awaken the Dawn" (2009). "Joy-An Irish Christmas" (2011), dedicated to their daughter, Eliza Joy, is a collaboration with luminaries from the world of Irish music. Its broad appeal led to a number one radio single, television appearances and specials, and an annual Christmas concert tour in the USA. Additionally, Getty Music has initiated a number of choral works based on each of these projects.